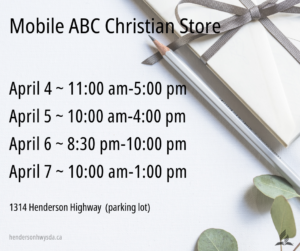 The mobile ABC Christian Store is stopping in Winnipeg for its spring run! Stop by to purchase games, Bibles, Christian videos, music, reading materials, vegetarian & vegan food products and more! TIP: Contact the store pre-order your favorite items. Email or phone 800 661 8131.